How to Make Almond Milk was posted on May 21st, 2011 and is filed under Dairy Free, Drinks & Smoothies, Low Carb, Recipes, Vegan. This entry has 54 comments. You can follow any responses through the RSS 2.0 Comment Feed. Most of our family tries to avoid drinking cow’s milk. Sometimes we use it for baking or use a splash in our tea, or we’ll use it when we’ve ran out of our nut milk, but generally I try to boycott it. I still eat dairy (but not as much as I used to), in the form of some cheeses, yogurt, chocolate (duh! ), and when it’s in recipes. As a singer, I really do feel like I can sing easier and smoother when I have less dairy. If I have yogurt, milk, or chocolate before a concert I can feel the difference. After drinking barely any cow’s milk for years I don’t even really like it anymore. I still have it occasionally for a bowl of cereal when we’re at someone else’s house (I travel a lot) or when I’m too lazy to make almond milk, and then I remember how much I like my precious nut milk. It seems to be cheaper to make almond milk, or at least on par with the same price as a gallon of cow’s milk. I worked out the numbers once to see if the price of buying all those expensive almonds was worth it. Yuppers. We love our almond milk so much. It’s silky, smooth, and tastes really good. It has a lot more vitamins and minerals that commercial cow milk. It’s also very low calorie, about 40 calories per cup. You switch your cow’s milk with this almond milk and you be taking eating 100 calories less a day! With so many people becoming dairy intolerant these days, the need for finding a dairy alternative is getting more necessary. And a lot of people are avoiding soy milk or don’t like rice milk. I don’t mind either, but almond milk definitely is my favourite. Here’s our recipe! You can make this a little thicker by using less water, but we like to make our dollars stretch a bit more. Rinse the almonds and throw out the old water. Toss the nuts and the rest of the ingredients into your high speed blender* (we have a Vita-Mix). Blend on high for 2 minutes. Now grab a big bowl and a cheesecloth (we buy a paint strainer from the hardware store! Works SO well and it’s super cheap! Be sure to rinse it before you use it!) and strain, strain, strain your milk. You want it smooth! Pour the milk into a beautiful pitcher and enjoy! It’s SO easy to make and everyone loves it! *If you don’t have a high-speed blender, I don’t think you need to worry. There’s no need to have a super smooth milk from the blender because you’re going to strain it anyway! Note: Be sure to buy good quality almonds. They cannot be roasted or salted. They must be raw. We made almond milk from different almond distributors than we usually get from (Costco! Best place ever!) and it was horrid milk, even though the almonds tasted okay by themselves. Perhaps they were slightly roasted. Keep refrigerated and if the milk separates after a day or two, just stir it up! It should be just fine! Enjoy! Oh, and don’t forget to keep your almond pulp on hand! There’s no use in wasting any of that goodness…so next post I’m having a special post from someone who has lots of lovely almond pulp recipes! Make sure you don’t miss it by subscribing here! Have you ever tried nut milk before? I had never given a thought to the dairy thing until a doctor, whom I respect and trust very much, told us that dairy is not a natural food for humans. He said that especially after 40 you may expect hard-to-diagnose problems which generally boil down to dairy allergies. Yay! I just tried making this a few days ago, it’s so much easier than I thought! You’re right in that it’s also really good value too, especially with the leftover almond mixture (perfect for adding to bread!). Am still working on making good vege burgers with the dried out almond mixture. My holistic nutritionist gave me the recipe so I should give her props for it! This is something I really need to try to make at home. Thanks for sharing the recipe. I buy the almond milk for breakfast and baking and they are so expensive! and not as good as you have said. I love almond milk but I’ve never made my own, I’m going to now asap! I can’t wait to see the almond pulp recipes!! 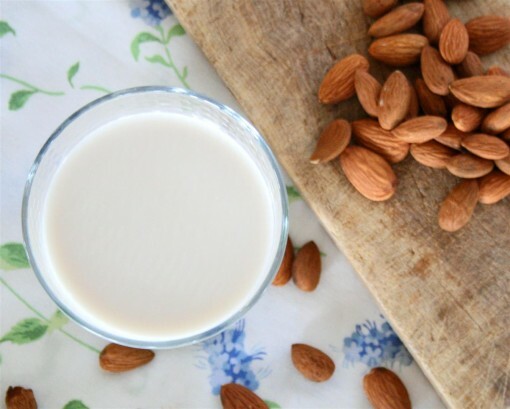 I never thought about making Almond Milk before…sounds like it would be delicious in baked goods. I’m not lactose intolerant, but I’ve been really curious about almond milk lately. I have raw almonds already, so once I get some cheesecloth, I’ll be in business! Thank you for the tutorial! Oh, so happy you posted this. I want to try it now. Honestly, the almond milk in the boxes scares me just a little. Maybe because I am a non milk drinker? I don’t know. Anyway. I love this recipe. And I love how you have a recipe for the almond pulp. Just perfect! I’m new here, and after reading your veggie stir fry post saw this post. My wife fell in love with Almond milk 3 weeks ago out of the blue. I had NEVER heard of it before. We had a silly conversation last week about how one exactly goes about getting milk from almonds, as we didn’t know. And now I do! Wow, this looks so easy! I usually drink rice milk, but I like almond milk too. I’ve never tried making my own, but that’s going to change today with the raw almonds I already have in the refrigerator. (I use them for making salad dressing.) Thanks! I wanted to report back that I made the almond milk. I left out the salt and vanilla, because I prefer it plain. I was amazed at how easy it was to make! Even better, it’s delicious! That’s it, I’m hooked on making my own now. I tried this last night and I loved it! I didn’t soak the almonds first, I forgot about that step but it still was really tasty! I love homemade almond milk on my cereal. I don’t bother to strain it because I like the almond bits in my cereal. Just shake really well before pouring. As others have commented, adding a couple of dates adds a natural sweetness and nice flavor. At times I have snipped off a section of a vanilla bean and added that, pod and all — just a little is enough. ok.. I am a little tired so did you like the milk with the Almonds from Costco or not? I couldn’t tell if you were saying the Almond milk from costco was horrid or if it was another distributer was horrid.. Please email me.. I just bought a bag of Almonds from Costco hoping to make milk. :) Thank you.. Love what I’ve read on yoru blog so far too. Thanks for sharing. Heather- We use almonds from Costco and love them! It’s almonds in bulk I dislike, they tend to be stale. Julia, we use our almond milk up very quickly, because a lot of us drink it…but I’m thinking about a week. Yes, you certainly can half the recipe! That’s a great idea! Wow thanks for the post, cant wait to give your recipe a go, just bought some almond Milk in a carton so looking forward to tasting the difference of it being freshly home made! How do you determine the calorie count. Please explain, thanks a bunch. Thank you Charissa, I appreciate your help. I am asking because my daughter was looking for a low calorie version as she is a raw vegan. Again thank you! Hey :) I love this idea! I have my almonds soaking right now. I was wondering if they had to be soaked overnight or if 6 hours was enough time to soak them? I am working tomorrow, so I will not have time to make the almond milk. Also I was wondering how many calories are in the almond pulp, I wanted to make the crackers but I was sure how to get the calorie count. Thanks! Elzie- Sometimes we just soak the almonds for an hour or two (sometimes we even blend it right away when we have no time), but it’s creamier if you let it soak longer. i made my first batch today and i love it. i was wondering how long will it last? i’m storing it in the refrigerator in a large mason jar. i realize it’ll split and still be good, but is there a noticeable odor when going bad…or is it just taste? also, is there anything special about how to handle to the pulp? is just laying it out until it dries all it takes before storing it away in a drawer (or refriegerator?). thank you. Chromewaves~ So glad you like it! We use our almond milk up very quickly, because a lot of us drink it…but I’m thinking it’ll last about a week. One time it did go bad and it looked a little curdled and tasted a little off. As for the pulp, we dehydrate it (or you could use an oven on low heat) before storing it in our freezer. thank you very much! i’m enjoying it so much more than the store bought stuff. perusing through your blog as well and getting lots more ideas. thanks! Can’t wait to try this recipe. Started using almond milk about 2 months ago and wouldn’t use regular milk anymore and now that i can my own, even a better reason not to drink milk. I was getting my almond milk in a box if 6 cartons. But got a huge bag of almonds this week to try your recipe. I was wondering how to store the almond bag so it keep it’s freshness. I would think the freezer, what do you think? Sylvie~ I love my almond milk too! After we use the almond milk bag (i.e. paint strainer) we just wash it out really well and hang it up to dry. It’s ready to use all the time. Once in a while we buy a new one. Hope that helps! I know this is a random question but im always confused about how almond milk is low cal, i mean almonds are super high in cals (1 cup ided say is like 200grms? so roughly 1100cals! so how is almond milk magically low in the stuff? Jess~ First of all, one cup of almonds is about 4 ounces. There are about 20-25 almonds in one ounce, so we’ll say about 90 almonds per cup. One almond is about 7 calories. So this would be around 630 calories…ish…per cup. However, most of these calories are taken out when you strain it. Not only that, those calories are all for one whole batch of almond milk (which is about 7 cups). Hope that helps! I think I have finally found a solution to my almond milk woes! !…You see, here in France the boxed variants are A) ultra pricey and B) ALWAYS include various sweeteners and thickening substances….I can make my own!! I so loved something called unsweetened vanilla “Almond Breeze” whilst in the US…and it was only 40 kcals for an ENTIRE cup! Is the taste similar here? I lack, sadly one of the two enzymes for correctly digesting lactose from cows…so this is a godsend…Merci bien! Donna- I’m so glad! You’ll love making your own! I’ve been experimenting with ways to use chia seeds, and today have come up with a goji berry and chia seed raw almond milk- tastes delicious and gives the milk an interesting texture! Definitely worth a try – check out my recipe here: http://www.indigomemoirs.com/2013/05/08/detox-almond-milk/. I have seen so many different calorie counts for almond milk – most of them just a little less than dairy milk. However, the kind I buy says that it is 30 calories per 8 oz! What on earth could account for the difference? And how do I know what mine is? Lee Vandrlin – Look closely at the label, some say “original”, “unsweetened”, “naturally sweetened with _____”…this is what often makes the difference. Personally, I either make my own or buy the unsweetened almond milk. You can use a calorie counting website like this one, that i used for this recipe (It might be about 10 calories off, more or less…but here’s a link: http://caloriecount.about.com/homemade-almond-milk-recipe-r96694). Hope that helps! 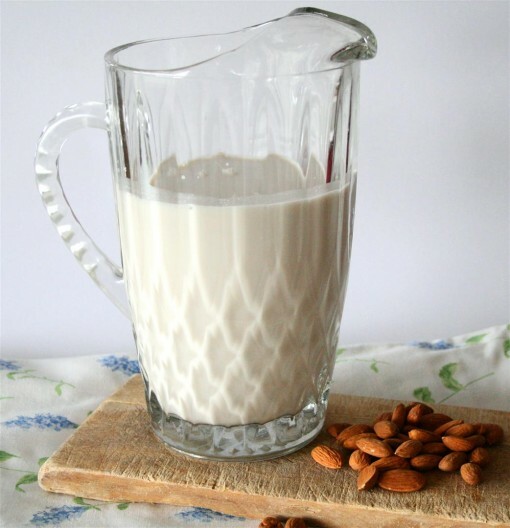 I bought a SoyaJoy over a year ago & have been making almond milk with it – so easy. And it has paid for itself with what I have saved on store bought almond milk. Recently I discovered raw hemp seeds & their nutritional value, so am now making a blend of almonds & hemp seeds.